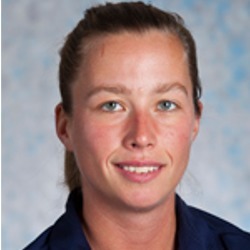 Rachel Moreland, who spent the last nine years as a member of the women’s soccer coaching staff at Emory University, joined the Colorado College women’s soccer program as an assistant coach in April 2017. In her roles as an assistant (2008-10) and associate head coach (2011-16), Moreland helped guide the Eagles to a 116-31-33 record and six NCAA Tournament appearances, which included a trip to the 2012 national championship game. At the same time, Emory recorded five top-25 finishes and a pair of University Athletic Association championships. Moreland coached a pair of All-Americans, 11 all-region selections, two UAA Players of the Year and 31 all-conference honorees. Prior to her nine-year tenure in Atlanta, Moreland began her collegiate coaching career as a graduate assistant coach at the University of North Carolina-Pembroke, which competes at the NCAA Division II level. Moreland was a four-year starter and two-time captain at Limestone College in Gaffney, S.C., where she started 60 of 67 games as a central midfielder from 2002-05. The three-time all-Carolinas/Virginia Athletic Conference selection recorded 41 career points, 20 of which came during the 2003 season when she scored nine goals and added a pair of assists. Moreland also earned a spot on the CVAC Presidential Honor Roll. Moreland earned a bachelor’s degree in business administration from Limestone in 2006 and her master’s in physical education-sports administration from UNC Pembroke in 2008. She holds a USSF ‘D’ license and an advanced national diploma from the National Soccer Coaches Association of America (NSCAA).d of 16.